Over the years I have written many times about how cabinetmakers, and just about all craft workers, were paid by piecework. This was very true in the UK and marginally true in the US. The slum workers documented by Jacob Riis were paid by piecework. Workers bought materials from wholesalers, usually on credit, and delivered them complete, done at so much per piece. 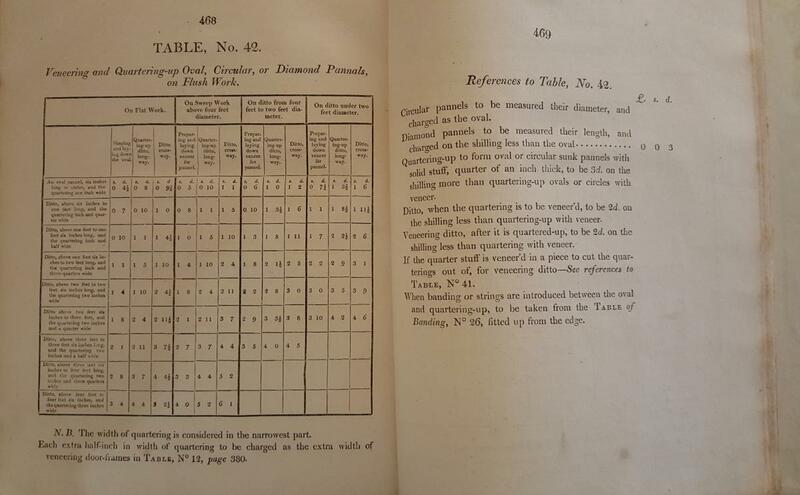 In the cabinetmaking world, even as early as the late 18th century, there were published price guides detailing how much a crafts-person got paid for particular tasks, although except in the best shops these prices were routinely discounted. Whole trades were organized like this. The chairmakers at High Wickham, for example, divided the tasks of making a chair into over 40 jobs, each paid a different rate. In order to make a decent living, workers had to specialize otherwise they could not get fast enough and the tool requirements grew unaffordable. All these people were considered independent and were paid by the piece and charged for bench rental, assistance, materials, heat, and even electricity after it was introduced into the shops. Rates were determined - in the higher-end industries, and by better firms - by negotiation with representatives of the craftsman (in many cases, unions). The formulas could be mindbogglingly complicated. Lower-end firms simply didn't pay the union rates and had lower fees. In good times, when labor was scarce, there might be a bonus on top of all this. In bad times, when labor was hungry, rates would be discounted. Pricing in the London Book of Prices didn't change from its publication in 1811 until at least 1860, mostly because there wasn't much inflation and there was also lots of pressure to keep wages down, but also because rate changes over time were done as multipliers from the basic rate. The published rates were also prone to lots of abuse - discounts, arbitrary charges, bringing in outsiders so that established craftspeople could not get enough work. Prior to the invention of machines, skilled labor could fight back. It's not an accident that craft unions were the first unions that had any power, even as early as the 18th century. Craft unions also pioneered insurance for injury, work stoppage, and loss of tools. (Tools were stamped with the owners name for insurance requirements). The trend toward wages based upon time rather than the completed piece came about as more and more industries mechanized. If in order to produce something you needed labor, a piecework wage to a craftsperson who brought their own tools and ways of working (within certain bounds) was the norm. As machinery and capital investment became more important, skilled labor was less important and a day wage for a machine minder became the norm. Payday, in cash, was on Saturday. In many trades the craftsmen took Sunday off and then Monday, the theory being that they needed extra time to sleep off the weekend drinking. But St. Monday as the "holiday" was called also was a call to independence. If you could work hard Tuesday through Saturday and make your production quota, why should the independent worker show up on Monday? By World War II most of these practices had died out or had been banned, mostly because whole craft industries collapsed. For example, when the chair-making industry in High Wycombe collapsed, it didn't mean people didn't want chairs; rather, the public just wanted different type of chairs, and the craft system could not adapt to them. New factories, built outside the old world of craft emphasized capital and machines over tradition and in many cases were built far from the old centers of craft. The piecework tradition was broken. The important thing to understand about these working arrangements is that nominally the craftsman was independent and had total responsibility for quality of production, tools, and equipment (such as it was). What they didn't have was any ability to individually negotiate price or claim any responsibility of the company for continuation of work, a good reference, insurance, or vacation. Does this sound like Uber? or any company in the new "sharing" economy? It should. And what we learned over the past centuries is that when you have individuals with no real control over the working conditions, and a company that no commitment to its workforce, it will end badly. In the case of the piecework crafts, eventually it turned out that massive spending on capital and mass production made the individual redundant, and a coherent unskilled workforce working on an assembly line was far more economical. Recently Uber arbitrarily lowered the rates it pays its New York City drivers and is investing millions in the technology of self-driving cars to replace thousands of "independent" drivers. Customers love Uber (and Lyft, Gett, Via, etc.) because they make hailing a cab a lot easier than the often dismal NYC taxi experience and most of the labor and work issues don't effect the customer. Is there any difference between a 19th century Sheffield grinder renting a wheel from a workshop owner and a web designer renting a seat from WeWork or any of the other co-working spaces? I mention all of this because when someone talks to me in glowing terms about the new job-creating "sharing economy," the phrase doesn't conjure up in my head hipster kids (anyone under 37) doing cool stuff when they want to but still having time to go mountain climbing. I think more of hordes of smart, well educated individuals working round the clock on some project until they either burn out or their employer loses their funding. And I think of Jacob Riis; I think of St. Monday; and I think that in two hundred years we are back were we started from. What a great post, Joel. I never made that connection before. I don't know how it gets fixed though...unions are not coming back, and you probably saw the story about how Wall St flipped out when one of the airlines gave workers a raise...there is relentless pressure not to raise wages or provide benefits. You are right, we are headed back to the 19th c.
Only by understanding the successes and failures of our past history and the underlying context to today can we strive to not replicate our mistakes- or inadequacies. This was quite enlightening and the parallels drawn more than a bit troubling. Thanks for history. Great and thoughtful post. Interesting how we 'older' folks start to develop a bit of perspective on history, time lines, our own experiences, etc. I think you nailed it. Lots to think about. One little piece of thought from my world: when someone would just say that '..if you are unhappy with your work, just change your career path!!! ", I would think to myself '..ok, who the heck is going to pay my bills and who the heck is going to cover the wage gap when I got from what I am doing now to a new job in a new career where I go back to newbie's wages.....' The answer: no one. "when you have individuals with no real control over the working conditions, and a company that no commitment to its workforce, it will end badly." Not for the consumer, or the change would never occur. Only "badly" for those who have invested their lives in crafts that are no longer needed. Uber hasn't ended badly, for example. It's ended badly for those NYC cab drivers who were previously creating a "dismal" experience for cab riders. If Uber lowered their rates paid to drivers, it's only because they had too many potential drivers available - some other competing ride-sharing service is free to pay them more, and if they do, Uber will have to match it. I think this started off as a good historical article, but steers off into the ditch at the point it started making value judgments based on how things should remain as-is based on the "good old days." From wic and hama place with dwellings - so you are nearly right - but later thought to mean dwellings in the valley (combe) or by the river Wye. My grandmother learned lacemaking in a nearby town, the female equivalent of bodging at the time I guess. What we all forget is our common human nature (or lack of). We profess to be raised with good Judeo-Christian values but when it comes to money in the bank "I want mine" and screw you. I guess we are only our brothers keeper on Sunday when the game is on. And all that 'love thy neighbor' stuff is only for suckers and liberals. Lets face it Uber and the robo world we are being blinded by, is us. It's our way of giving the finger to God because we can do it better and write our own holy books (or rewrite them at will). Screw all commercial drivers and the economy that supports them as long as we can drive wages down and give wealth to the few. Who needs labor anyway. Lets make America great again and all that s**t think. Why should we care. We love our selves and our contry to much to see what we are doing to each other and to our common purpose in this life. Lets face it we don't have a clue what we a doing here and most of us just don't care as long as a few of us have it all. It's that damn Obama. The words "Sharing economy" is just a way to disguise what is a "procuring economy". Don't get me wrong, I appreciate the work done by the grocer at the street corner. He wakes up early in the morning to get fresh vegetables at the market. He is doing some heavy work. With the industrial revolution, capital was needed to buy machines and they owner become intermediate between the worker and the consumer. Beside the good reasons, one of the reason invoked to send kids to school was to prevent them to learn they father's craft (weaver) so they could be hired as unskilled workers. With the uberisation, you don't need much capital to start an intermediate business: one computer and an "app". Then you can take a percentage on the work made by other people at their own risk/liability with their own investment (tool/ vehicle/ house/ kitchen/ etc. ). With the benefit you buy more powerful computers. Note that it is the computer which does the intermediate work while you enjoy your sleep. Wow, you're right! I had never made the Uber-connection either, but it makes sense. Sure, there are differences. And sure, consumer demand is much of the driving force here--though ruthless corporate culture is also a factor. And yes, as was pointed out above, the consumer will benefit, at least for a while. The problem, though, is that you can't neatly divine "workers" from "consumers." Most of us are both--sometimes even at the same time. I know I would rather work for an institution that had a sense of loyalty to its employees, and a vested interested in the long-term wellbeing of the people it employs. And on balance, I think I would rather do business with such a company as well. Your commentary is spot on! Raised on The Almanac Singers and The National Guardian I have watched the corruption and disintegration of unions, the willing abandonment of bargaining power by workers, and the massive shift in power to employers over the last 50 years with great sadness. There are many causes for being back where we started 200 years ago, but surely ignorance of history and of the power of collective action are among them. Thanks for your blog. I am sharing it with some friends and family.